Murray Hill has recently taken off as one of the hottest neighborhoods in Jacksonville! Over the past couple of years, amazing restaurants, successful small businesses, and newly renovated homes have brought historic Murray Hill into the spotlight. One family-owned business, Faith Jewelers, has called Murray Hill home for over a decade, and paved the way for local entrepreneurs in this unique area. I met with John Strickland, manager of Faith Jewelers, to learn more about the jewelry store and his family! How did you decide to get into that business? I’m not sure that there was a conscious decision on my part to become a jeweler. I’ve been around the jewelry business for most of my life! When I was a kid, my mom worked at her best friend’s jewelry store in downtown Jacksonville. I would go there after school and clean and polish jewelry for customers. 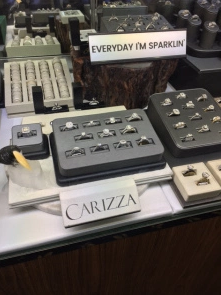 Years ago, just after her friend passed away, Mom decided to open her own jewelry store in Murray Hill. So I’ve been here in some capacity since the beginning, except for the time that I was a student at Florida State. When did your business first open? Mom opened Faith Jewelers on November 2, 2004. It’s easy for me to remember because November 2nd is election day. We’ve been here for almost 13 years now. Is there a story behind the name of your business? 8 out of 10 small businesses fail within their first year, so opening any business can be a risky endeavor. That’s especially true when opening a fine jewelry store, because it costs so much money to stock the merchandise that people expect—gold chains, diamond engagement rings, birthstone jewelry, etc. My grandfather put the idea in my mother’s head about starting the business, but she was scared to death about finding the capital to open. My family isn’t rich, and at the time my dad (who was a K9 officer for the Jacksonville Sheriff’s Office) was the only source of income for our family. She put a lot of thought and prayer into the decision, and in the end, she decided to “step out on faith” and open the store. 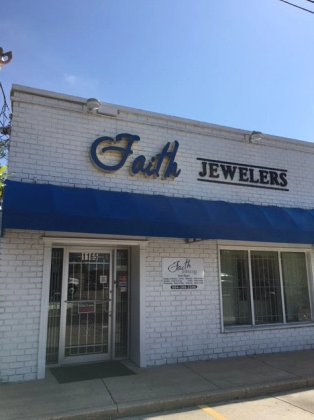 They mortgaged the house, and trusted the Lord, and that’s why she named it Faith Jewelers. What is a fun fact about your business? We are masters of affordable customization. Speaking as a millennial, millennials LOVE having custom jewelry made, because we are all very special snowflakes, and each of us is unique among other snowflakes. So when it comes to a jewelry item that you wear every day—like an engagement ring—you really want it to speak to your own personal style. The problem with custom design is that it’s typically very expensive, because you’re paying a person to design the jewelry item, then carve a wax model of it, then use the wax model to cast the jewelry item in gold or silver, and then they have to set all of the stones into it by hand—diamonds or whatever gemstones you choose. We can do that the old-fashioned way, but my favorite thing is customization rather than custom. One of my favorite lines that we carry—Ever & Ever—allows us to take a ring that you like, and change the design online in real time (set different shapes, sizes or colors of stones, add or takeaway design components like halos and filigree, change the finish, you name it…) to make an end product that you absolutely love. The difference in cost is pretty remarkable, too. About $600-$1000 to the customer for a setting that would otherwise cost thousands. What is the most rewarding aspect of your business? Jewelry is special. If you think about many of the important moments in your life, jewelry is often involved. An engagement ring is probably the most ubiquitous example, but there are others: a mother’s ring or pendant for your wife after the birth of a child, a strand of pearls or a watch for someone who is about to graduate from school, or handing down a special heirloom when a loved one passes away. I think what is most rewarding is that I’m always getting to meet new customers, and they often wind up being friends because I catch them right before or right after some of their more meaningful milestones. It’s a special bond. I’m reminded of a customer that I had at the beginning of the year. It was a 94 year old woman who brought in an inexpensive Star of David pendant in sterling silver, that was set with marcasite stones. Her grandmother wore it when she came to America from Austria to flee the Holocaust. It had already been passed through three generations of women in the family, and she wound up giving it to her granddaughter that weekend when she turned 18. John showing me the process of buffing, polishing, and rhodium-plating my rings! What is your favorite local Jax restaurant? Oh that’s a tough one. Can I pick two? I love the pork chop at Orsay, but the chicken and waffles at Moxie is pretty life changing, too. Okay, three. M Shack. What is your favorite thing to do on a sunny Saturday? Well, the jewelry store is open on Saturdays, so my weekend starts on Sunday. I usually roll out of bed, go to church, go eat somewhere, take a nap, wake up got to the Y (maybe), then head to the Dreamette for a birthday cake-dipped ice cream cone. And then it’s Netflix. Right now I’m watching Stranger Things. What is your favorite thing to do on a rainy Saturday? I’m kind of a nerd, so I usually like sitting on the front porch with a good book. How long have you lived in Jax? Pretty much my whole life. I went to FSU, so except for the few years that I lived in Tallahassee, and my first job after college in Charlotte, NC, Jacksonville has always been home. What part of town do you live in? I am treated like family every time I walk into Faith Jewelers! The warm smiles, customization, and attention to detail make this gem of a store stand out. Be sure to stop by and say hi next time you’re in Murray Hill!